this is a sponsored post for nutrish cat food. while the lovely people at nutrish have supplied my cats with some fantastic cat food for this post, the opinions and ideas are all my own. for more information on nutrish and to receive a coupon to switch to nutrish, please click here. one of the reasons we love nutrish is because of rachael ray's commitment to give back and help animals in need. you can read more on her website www.nutrishforcats.com. we have two cats. yes. five kids and two cats. if my kids didn't have allergies, we'd probably have dogs too. it's enough to make me tired just saying it. still, a couple of years ago when we made the decision to get pets, we did so for many reasons. one of those reasons was to teach our children the importance of caring for another creature and the value of that responsibility. our goal is to teach our kids skills they will need to be great adults and parents and having pets is one way we are building those skills. this has not been without struggles and we have had to find workable ways for the kids to care for our cats. let's face it, with five kids to care for there is little time for me to take care of two more living creatures. so, among the chores for the kids each week are "cat duties." my kids have had to grow into some of the chores and we have had to adapt to make the process work for little hands. here are some of the ways we have made pet care accessible to our little people. 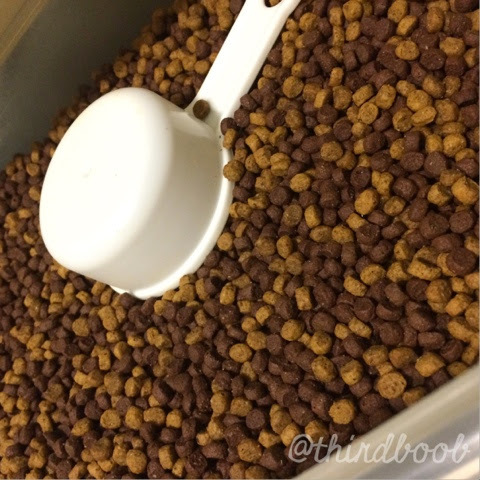 pet feeding: my kids are responsible for feeding the cats. we have a huge cat food bowl. this serves multiple purposes. first, the two cats can eat at once. second, we don't have to refill the bowl everyday. and, third, it is easier for small children to fill the bowl without getting cat food all over the floor. this bowl is big enough that my four year old has been feeding the cat for more than a year. a couple of scoops in the big bowl and we are good to go. warning: this bowl is also very appealing to extra small hands. i have walked in to find that my toddler has given the cats a bite of cat food and then has taken a bite himself. he's the fifth born so we just shrug and move on. if you are concerned about such things, i would make sure the bowl is not accessible to extra small humans. we also keep the huge bag of our rachael ray nutrish cat food outside and keep a plastic tub accessible to kids indoors. 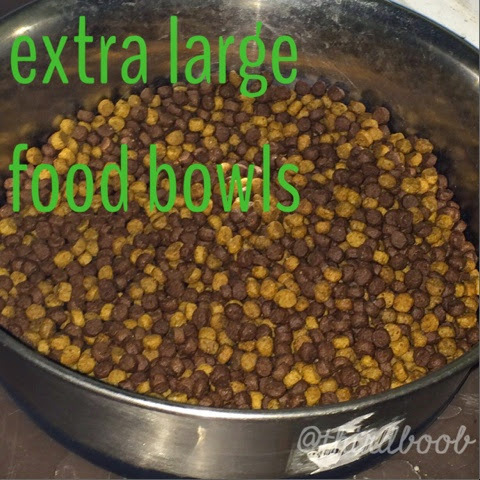 it is stored with a plastic measuring cup that makes filling the food bowls easy. everything that simplifies to make it a kid-friendly task saves me work on my end. litter pan cleaning: our kids have to clean out the litter box. there are a couple of things we do to make this an easy process. we've learned that if anything requires too much work the likelihood of it getting done without incident is close to none. 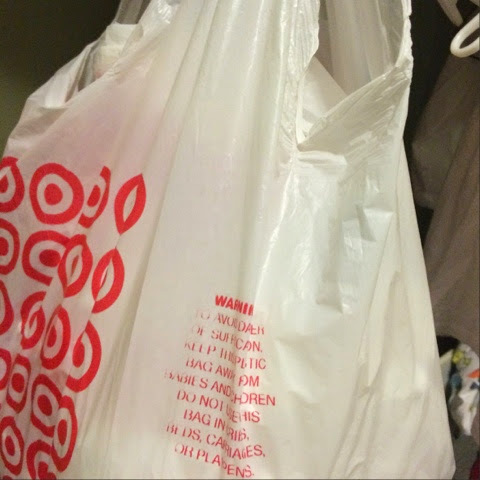 we have placed a bag of target bags for easy litter box cleaning and a scooper right where all the kids can reach. there is also a pail for them to dump the filled bag into right outside the door. few steps + easy execution = success...most days. 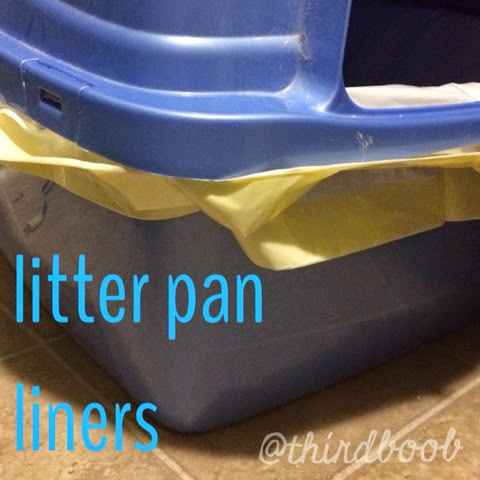 we also use litter pan liners. 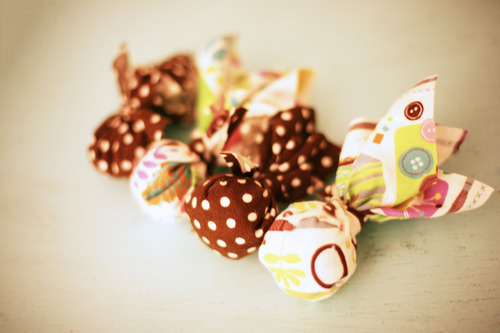 you can purchase them at the grocery store or make your own with a garbage bag. they fit around the bottom of the litter pan and can be picked up and thrown away with ease. 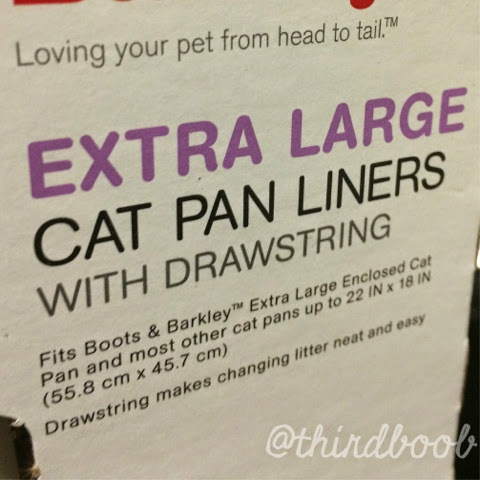 this keeps the litter box from absorbing unpleasant smells and makes changing out the litter a breeze, even for the kids. we completely change out the litter box at least once a week to keep things smelling fresh. this combined with litter pan deodorizer helps to ensure that our house smells fresh, even with two cats. 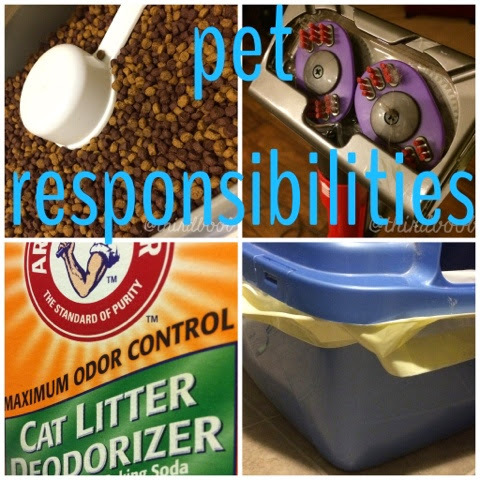 pet hair cleanup: i hate having pet hair in my house. i feel like it makes things constantly look a little dingy. so, the vacuum is my best friend. my two year old can vacuum like a champ and my four year old has mastered it all around the house. we have a great vacuum that has an stair attachment. we've used this attachment on all sorts of surfaces and it picks up pet hair beautifully. 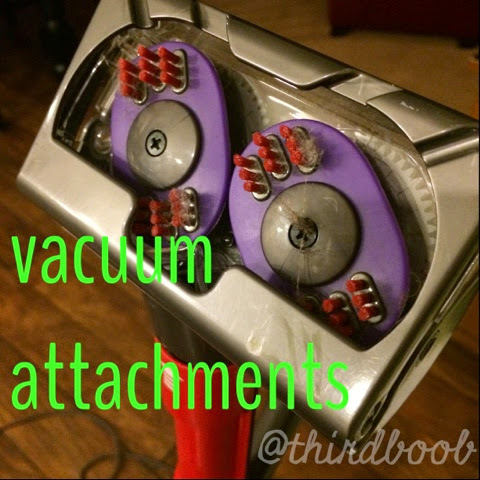 we use it so often that it is permanently left on our vacuum for the kids to pick up cat hair anywhere it may lie. it's a beautiful thing. pet playtime: all animals need attention and part of caring for them is playing with them. the kids have to spend time each week playing with their pets. the cats love toys...lasers, feathers, etc. and the kids are pretty good about spending a few minutes each day keeping the cats occupied. there are also some great diy ideas to make homemade cat toys and the kids can make their own toys to keep the cats busy. what about you? what do your kids do to help care for the pets in your household? grief, loss, acceptance and love.